THE coordinator of Tipinini Kairiki law and order restoration committee in Enga’s Porgera district claims the Porgera Development Authority (PDA) has not delivered any tangible developments to the people. Nickson Pakea said some of the developments reportedly initiated by the authority in a full-page paid advertisement by chairman Nixon Mangape in The National last Tuesday were non-existent. Pakea said one example was, Mangape’s claim that the PDA had built a road from Tipinini to Taiapoko which was not true. He said no such road had been constructed and a coffee project had been abandoned because there was no road to transport its produce. He said the people knew too well for the chairman to mislead them through such media reports. Pakea said since the establishment of PDA, millions of kina had been given by Barrick Gold Ltd and the national government in grants but no developments had been delivered. 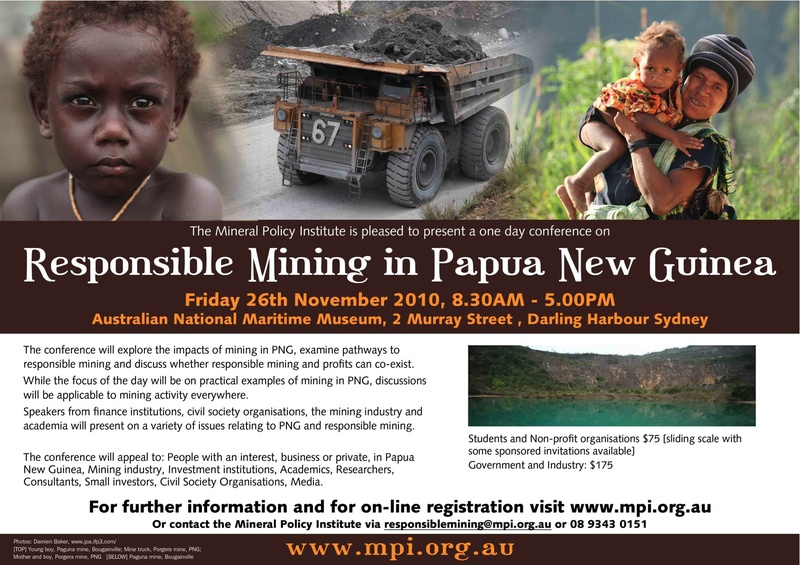 Is sustainable mining possible in Papua New Guinea? In the 1960’s and 1970’s, the large Copper and Gold mine at Panguna on Bougainville Island was hailed as the ‘cash cow’ of the fledgling PNG government. 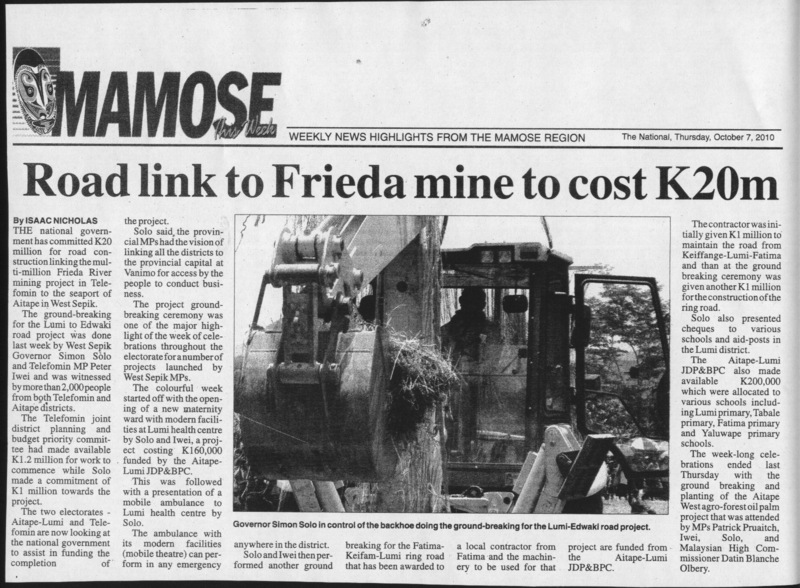 The mine was intended to provide a steady source of income for the PNG government coffers after Independence in 1975. After many years of civil disobedience, a civil war, the deaths of thousands and a near mutiny by the PNG Defence Force (PNGDF), the Panguna mine remains closed. Investors would no doubt be wary of reopening the mine even if the local people succeed from mainland PNG and either set up their own nation or join the Solomon Islands and the people they feel ethnically part of. So what can be learnt from what happened to try to ensure it doesn’t happen again? The major shareholders of Bougainville Copper , a subsidiary of Conzinc Rio Tinto , are Rio Tinto (53.6%), Papua New Guinea (19.1%) and the European Shareholders of Bougainville Copper (ESBC) with approx. 4%. The remaining freefloat of 23% is held by private investors, many of which live on Bougainville Island. These shareholders are presumably receiving nothing on their investment. There are moves afoot by the new autonomous Bougainvillean government to try and reopen Panguna yet the local landowners are currently holding out against this move. So is this is a classic case of NIMBY or (Not In My Back Yard)? So what happened at Panguna? Let’s examine some of the background issues. The Panguna mine was opened during the Australian Administration of the then External Territory of Papua New Guinea (TPNG). The Territory was a collection of disparate ethnic groupings artificially crunched together from the 19th Century colonial carve up of the world. The original German colony of New Guinea was added to the Australian Territory of Papua and administered as a joint Territory after the Second World War. The people of the islands of Bougainville and Buka are ethnically tied to those in the old British Solomon Island Protectorate (BSIP) and were artificially separated from their cousins by a line drawn in the map of the Melanesian Pacific by previous colonial powers. The people of Bougainville often refer to the people of the rest of PNG as ‘retskins’ (Tokpisin for ‘red skins’), since Bougainvillians are like most Solomon Islanders and noticeably darker than most of the PNG people. The first issue was therefore a potential for resentment that the resources of Panguna and Bougainville were being used for other regions of PNG and not specifically to benefit the local area. It was clear that a large resource was being removed from traditional control without any real benefit to the local people. Historical documents at the time also indicate other issues. There was reportedly an historical dispute over exactly who originally owned the land around the mine. The local clan’s claims were disputed by those who had previously been pushed off the land by those who were in residence when the mine was initiated. Traditionally, PNG land ownership disputes were settled by clan warfare. Mineral rights had never been considered as no mining had ever previously taken place. Mineral rights were never considered by the Administration until the House of Assembly by majority vote in November 1966 awarded 5% of the royalties to local Bougainville landowners. In addition, the compensation offered to landowners was negligible after considerable tracts of land were required to develop the mine. The area of land far exceeded any small scale gardens originally nominated due to access roads and overland power pylons. The third and potentially most divisive issue was that the Special Prospecting Authority of 1,000 square miles and the exclusive Prosecting Licence of 25 square miles reportedly did not give any specific entitlement to mining rights. Under Australian legislation, these rights had to be negotiated. Lastly, it is understood that as it was specifically the Administration’s legal responsibility to negotiate with landowners, mining companies considered themselves excluded from any requirement to discuss these issues with the local people. The stage was clearly set for an impasse many years before it happened. The concept of land ownership in Melanesia is complex and needs to be understood during discussions over the development of any locally owned natural resource. Ownership claimed by some governments but disputed by original landowners who have never given up their traditional rights Government ownership of minerals under the ground and this is controlled by mining leases and permits. Traditional Melanesian owners still view that which is in their ground as being still theirs to own. Traditional ownership of these resources with national government claiming some control. All resources controlled and policed under government legislation Traditional owners view these resources as theirs to own, control and use and not the government’s. Traditionally protected by clan members and by force if necessary. Nominal government responsibility mostly in name only. Government legislation and a reasonably effective legal and court system available, Strong government controls versus weak government and an acceptance of the use of traditional force to defend these resources if required. The history of the development of natural resources in Melanesia has been mostly focussed on the extraction of the resources (minerals, timbers, marine), in the most expeditious manner using western concepts of wealth transfer. Between the two World Wars, the Administration of the Trust Territory of New Guinea, as opposed to the Australian Territory of Papua, was primarily paid for from gold extracted from the Wau/Bulolo area. The traditional owners of this resource were not considered as the gold was viewed in the Western concept of being government owned. In addition, due to the understandably somewhat belligerent nature of the local people, many workers from other areas in New Guinea were brought in and employed in the extraction of the gold. These outsiders settled in and around the towns and established families. During the late 1930’s, enormous mechanical gold dredges were flown into Bulolo in pieces and assembled on site. The mullock heaps left by the dredges from their alluvial operations was soil previously at the bottom of the river. After the dredges ceased operations, these huge waste dumps were taken over by outsiders as ‘new land’ and therefore claimed as their own. The perception of the descendents of the original landowners is now underlying hostility to the ‘foreigners’ who are now ensconced within the local gold producing community. Recent riots in early 2011 where the local Watut people have demanded the repatriation of people from areas like the Sepik are an example of how the problem of how local people view those from other regions benefitting from local resources. An example of historical necessity creating problems for today happened in the Solomon Islands. During World War 2, the American Forces there decided they needed more labour than was locally available on the island of Guadalcanal and imported workers from the neighbouring island of Malaita. Recent riots and loss of life from civil unrest between local Guadalcanal people and the descendents of the Malaita labourers have led to the requirement for foreign ‘Peace keeping troops’ from regional neighbouring countries (Regional Assistance Mission to Solomon Islands – RAMSI) to now become a long term necessity. The development of the Nickel mine in New Caledonia is another example of large scale mining in Melanesia. While the French government claims the Island is French territory and therefore bound by French metropolitan law, the descendents of the original local Melanesian people who owned the island have no claim to the wealth being generated. Yet when the mine’s waste overflowed and reportedly poisoned the surrounding sea, local people saw their livelihood severely threatened. Viewed from a ‘Western perspective’ (refer to the above matrix), the concept of resource development is fairly straightforward. While there are many examples of where either a lack of forethought or subsequent operational problems have caused protests and the premature closure of an activity in Australia, developers can fall back on government protection and legislation. The issue of who owns the available natural resources can if disputed, be legally determined by a court. This is not necessarily the case with resource development projects in PNG where government legislation is either contested or ignored and government control in rural areas weak to non existent. This has led to many confrontations between local landowners and mining companies as was the case with the Panguna mine. The local Bougainville people felt they were not consulted about the project, fully informed about the implications or sufficiently compensated when their land and natural resources were disrupted or destroyed. Recently, in other areas in PNG, there have been reports of many local landowners being forcibly removed from their land in order to allow mining projects to go ahead. The nature of PNG customary land ownership often leads to disputes over just who is a landowner and who should be included in any benefits or compensation on offer. In a recent development, the Somare government has decided to foster initiatives to bypass any delaying tactics by local landowners that might hinder development of the nation’s natural resources. A so called ‘Maladina Amendment’ (named after the MP who proposed it), and pushed through the PNG Parliament by the Somare government against all opposition and extensive public demonstrations, specifies that the Head of the Environment Department can singlehandedly determine if a proposed mining project meets PNG legislation. This was in answer to legal injunctions brought against the predominantly Chinese owned Ramu Nickel mine near the coast at Madang. If a future PNG government repeals this legislation, what happens to an already operating mine that depended on this law to override original local landowner objections? What happens if current landowners resort to violence to prevent their land and sea resources from being polluted? Will the mining company resort to armed intervention from privately hired police as has reported elsewhere? Recent concerns have also been raised about the use of Special Purpose Lease Agreements that have been allowed to be formalised by the PNG government and reportedly cover 10% of the country. These agreements permit traditionally owned land to be ‘leased’ and not sold. Once a ‘lease’ has been negotiated, say for the growing of Oil Palm or any other commercial crop, the present forest and timber resources must logically be ‘removed’ by the ‘developer’ who then can sell this resource. Whether the commercial crop then ever gets planted and returns an investment remains problematical at this stage. How any ‘lease’ payments are disbursed also raise significant concerns due to difficulties in determining exactly who is a landowner and what their share might be? Resource development in PNG – where to from here? Extractive industries are by their very nature, disruptive to the existing environment. The existing natural environment is very often the only source of wealth local landowners have. It may also be the only source of income and food production available. In addition, local customs and traditions concerning the land may stretch back many generations. This involves the ability to hunt and fish and where necessary, obtain building materials and other personal requisites from the surrounding forests. Initial payments to landowners made by developers may at first be very welcome. When the offers of money, new schools and education opportunities, health facilities and infrastructure development may first be well received, subsequent misunderstandings over who receives what share of the available remuneration can lead to subsequent disputes. A lack of formal education may promote miscommunication between the parties concerned. This can inevitably lead to mistrust and possible conflict. Signed contracts are not a feature of traditional village life and may not be viewed in the same way as in a western country. Having a signed contract that has been endorsed by the government has demonstrably been proven to be no guarantee that there won’t be future disruption and possible cessation of operations and loss by the developer. What happens when the available ‘compensation’ is fully spent and no longer available or completely missing for future generations is also a divisive issue. Future benefits for a few local landowners may be disputed by others who see themselves missing out. The PNG government will also wish to assume financial benefits that will be claimed are for the whole population. If these subsequent monies are then lost through corruption, the responsibility under Melanesian custom, could be seen to include all those involved with the original contract. Local people may well ask what long term and lasting benefits will be? Who will maintain the schools and health centres when the development activity ceases? When mining ends and the company leaves, who will pick up the pieces? Is there any enforceable arrangement available to the local landowners if they cannot rely on their government to act for them and defend their interests? Who will be responsible for the restoration of the local forests, rivers and marine resources if they have been irrevocably destroyed, either intentionally or unintentionally? What surety is being offered in case a natural disaster occurs and the by products of a development activity pollute the local environment? Before any decision is made to commence any mining activity in PNG, a full ‘holistic’ background check must be made and all stakeholder views considered. Recognition of the Melanesian concept of ownership involved with any extractive industry involving natural resources, either on land or in a marine environment, will assist any negotiations. The lessons to be learnt from the Panguna mine on Bougainville should not be overlooked. As Rio Tinto owned company Bougainville Copper Limited (BCL) and pro mining Government Leaders still insist that the re-opening of Panguna mine is just around the corner, even the BCL shareholders seem to have some idea that they have been told stories far from the truth: At the beginning of this year the BCL shares sold at just over $2.00, by the 10th of May they sold at only $1.28. The European Shareholders of Bougainville Copper Limited (ESBC) had a FAIR VALUE STUDY of BCL established by Mr. Anil Bakaya, Pune, India http://www.buyselltips.net on May 10th, 2011. BCL reported that with new technology available they plan to increase production levels by 30% compared to 1987. Mr. Bakaya reveals that the mine life will be at least 14 years. If the mine isn’t expected to last longer than 14 years, how is that going to sustain the development of Bougainville? The proposed royalty of sales to the landowners will be 3.5%. That is annually US $107 Million according to Bakaya’s study whilst the BCL shareholders earn US $2008 Million per year after they have paid the operating costs of US $933 Million. What I am making out of these figures is: the announced fairer contribution of profits by BCL is only fairer in the way that landowners get a little bit, compared to the last century where they didn’t get anything at all! BCL’s shareholders still plan to walk away with the majority of the profits, leaving a pittance to the traditional owners of the land, who will be left again with the destruction and pollution. I am glad to see that BCL’s Chairman Peter Taylor got himself a second job by being elected the new President of Australia New Guinea Business Council. (I can’t believe they couldn’t find someone a little less biased!) He won’t have much work with BCL any more as there is no chance that Panguna will re-open under these conditions. BCL seems to think that Landowners can be tricked into thinking that mining is good for them. Their new homepage bears now the name: “bclbilongyu”, “BCL belongs to you”. I believe the figures above prove the contrary. Already in the sixties, Bougainvillians opposed the principles of large-scale mining, but it took them until 1989 to close the mine that was destroying their land and health. This time round the Landowners will make sure their livelihood isn’t completely destroyed by letting BCL back in. Being only after monetary profits BCL can’t be trusted. Radio Australia is reporting the Chairman of Bougainville Copper (owned by Rio Tinto) is to visit Bougainville for the first time since the Panguna copper mine was shut down by a bloody civil war in 1989. The invitation is part of a strategy by Bougainville’s President John Momis to attract new investment. Mr Momis told investors attending the Papua New Guinea Australia Business Forum in Madang that the peace process on Bougainville is well established and the island is open for business. Mr Momis said he would like to attract smart responsible investors who will create jobs and improve life for rural people in the lead up to a referendum on independence from Papua New Guinea. Ninety per cent of Bougainvilleans live in rural areas and President Momis said it is essential any new investment include them and take into account their culture. The Chairman of Bougainville Copper will be part of a delegation of business leaders to visit the island on Thursday. President Momis acknowledged there is still some opposition to the re-opening of the giant Panguna copper mine but he said the majority of Bougainvilleans want the prosperity it would bring. Mr Momis said the return of Bougainville copper shows there has been a sea-change in attitudes and economic conditions on the island. The government is being asked to pay K20 million from the public purse for a road to service the proposed Frieda river gold and copper mine in East Sepik Province. The mine is jointly owned by Xstrata and Highlands Pacific (who also has a stake in the controversial Ramu nickel mine in Madang Province). 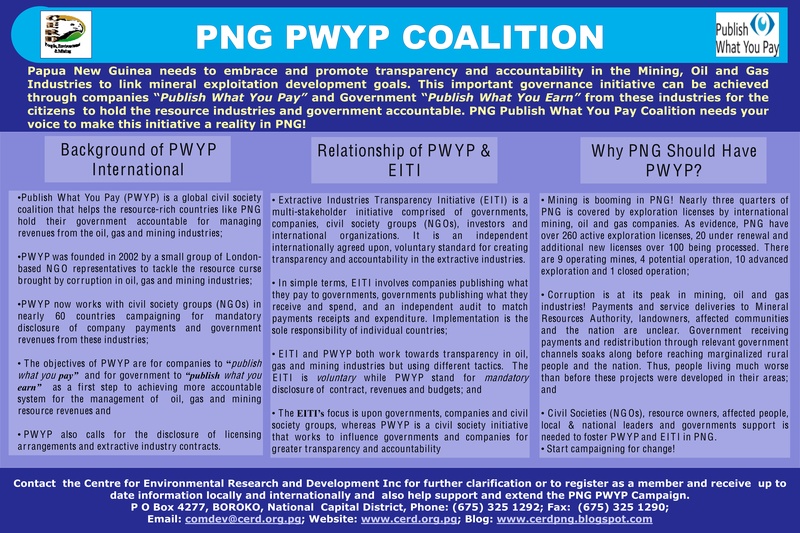 Isn’t one of the attractions of inviting foreign mine companies into PNG that THEY are meant to pay for the infrastructure to support their operations – not the tax payer?